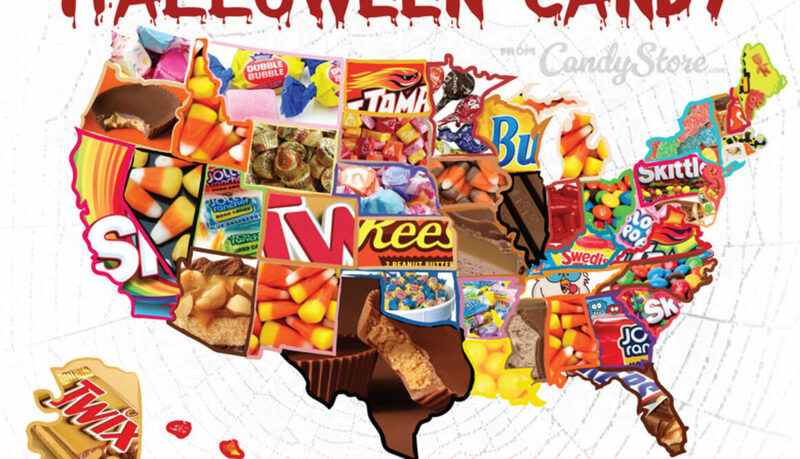 CandyStore.com, an online seller of bulk candy, has been tracking candy sales in every state for the past 11 years, and it released an annual list of the most popular Halloween candy in every state, based on the number of pounds ordered over a given year. Some classics — Milky Way, Candy Corn and Skittles — are beloved across the country, but other states have particular favorites: Connecticut residents love Almond Joy, and Louisianans can’t get enough Lemonheads. Alabama’s favorite Halloween candy remains the same as last year: candy corn. In last year’s report we saw Hershey’s mini chocolate bars fell from the top spot to number 2. This year it dropped off to #3. Overtaken by Tootsie Pops for runner up. We joked about ‘bama’s Choctaw roots…Choctaw, chocolate. But it seems like those historical roots are fading. Tootsie Pops have risen above the chocolate and become #2 in Alabama. Candy corn is still the strong leader, over 62k pounds worth of candy corn. Maybe it figures since they look like little A’s. Roll Corn! If you live in this state, it might be wise to cut your candy corn offering with some Tootsie Pops this year. Alaska still loves Twix. It was the top candy last year as well. The dual candy sticks probably remind Alaskans of the skis they use to get around in the winter time. Or for exercise? Ok, I don’t know if Alaskans ski or just ride the grizzlies in the wintertime, but either way, they love the crunch of the twin candy bar candies. Stock up on these for your trick-or-treaters if you’re in Alaska. But be careful to listen for growling before opening the door. Fun fact: No one is Arizona observes daylight savings time. FALSE! Navajo Nation actually still does as the territory crosses the AZ border into New Mexico and Utah. How many Snickers bars would it take to fill the Grand Canyon – over 10 million? That’s how many bars Arizonans ate over the course of our study. The 48th state can sure put away chocolate bars! Hot Tamales and Hershey’s Kisses are right behind them though. AZ has come a long way since camels transported hay to Camp McDowell. The only state with an active diamond mine is rich in a lot of things. Johnny Cash, Douglas MacArthur, dulcimers. You might even say they’re jolly. That’s right, Arkansans love Jolly Ranchers at Halloween. This is even more fitting when you consider the vast acres of national and state parks in the state. If you find yourself in Arkansas for Halloween, double down on Jolly Ranchers. Back it up with Butterfingers. Think California is all about earthquakes and wild fires? Well. We’ll have you know that the biggest earthquake in US history …was actually in Alaska. Boom. Thank you very much. Move along haters. …Oh yeah the fires, thing. I’ll get back to you on that. California’s most popular Halloween candy has changed again this year. The birthplace of Jelly Bellys has acquired more of an affinity for Skittles than last year’s winner M&M’s or prior winner, salt water taffy – to say nothing for jelly beans. Over 1.6 million pounds of Skittles don’t lie. Californians prefer to taste the Venice Beach rainbow. Twix has come back! Colorado’s most popular Halloween candy has changed againthis year. Last year, Milky Way overthrew Twix in the mountains of Colorado. Now Twix has re-taken the lead! Given recent changes in consumption habits surrounding sweets in Colorado, we would not be surprised to see further changes in the coming years. Stay tuned in the Mile HIGH city, but for now offer your trick-or-treaters Milky Ways and Twix. Colorado was the first state to legalize recreational marijuana. Did I just ‘explain the joke’? Connecticut is the state where the constitution was signed. Historical. And they love Almond Joy, which we find remarkable and lovely. Almond Joy is the number one candy here for the third straight year with Milky Way coming in second, M&M’s third. CT loves Almond Joy almost as much as they love newspapers. Over 144 newspapers are published in CT. That’s one newspaper for every 25k people! If you’re in Connecticut for Halloween, try to clear your porch of all those papers and make sure to offer the kids some Almond Joy, or the second place winner Milky Way. Delaware has once again proclaimed Life Savers as their favorite Halloween Candy – third year in a row. Nearly 21k pounds of them. Second place, however, has seen a change. It now goes to Candy Corn. Third place is Skittles, last year’s runner up. Since Delaware is the second smallest state, odds are you won’t find yourself there for Halloween, probability wise. But if you do, make sure you’ve got Life Savers. Butter Rum in particular does well. The sun shines strongly here, transforming many an upstanding Florida citizen into the Mr. Hyde of America, Florida Man. And as Florida Man knows all too well, you’re not yourself when you’re hungry. Maybe that’s why Snickers is the new top Halloween candy in Florida. Skittles has been bumped down to #2. Tasting the rainbow has become slightly less of a priority to Floridians, and I frankly applaud their self-awareness because of it. Over 330 tons of Snickers. Skittles came in second place, Reese’s Cups third. We took a lot of slack from Georgia trolls over Swedish Fish the last couple of years. It had been the two-time winner, until now. I’m pleased to tell you that you can stop with the hate emails and Reddit flames, Swedish Fish have been taken down by a new winner in Georgia: Jolly Ranchers. Hopefully something Jolly will appease and keep the Georgian troll tribe under their little troll bridges this year. Jolly Ranchers came in at over 142,000 pounds and was the 3rd place candy last year, leap-frogging second place. But, yeah Swedish Fish were #2. What can I say, Georgians love Swedish Fish. Over 100k pounds of Swedish Fish, this year. Hershey’s Kisses fall from #2 to #3. Hawaii’s most popular Halloween candy remained unchanged this year. Skittles keeps the Hawaiian crown. Hershey’s Kisses fell from the top spot last year and made way for the new winner of the Pacific Island state. It’s no surprise that the people of this gorgeous island want to taste the rainbow. Skittles is the champion with over 275k pounds consumed. Also, did you know the east-to-west Hawaii is the widest state?! King (candy) corn reigns in Idaho, just like last year. Home of beautiful mountains, the largest single piece of protected wilderness in the US and, of course, potatoes, Idahoans love their candy corn for Halloween. Second place goes to Starburst, Snickers third. “The Windy City” doesn’t mean what you think it means. Most people think it’s because it gets windy there, well yeah it does. But(!! ), the real reason for this catchy moniker is the ample hot air flowing from long-winded politicians of the 19th century! Ha! An article in the Chicago Daily Tribune from 1858 got the ball rolling and the name has stuck. Take that to the watercooler, Chicago watercooler goer. Man, Illinois always keeps things interesting whether it’s mythical monikers or Halloween candy data. There was much upheaval last year with the top 3 spots all changing hands, and this year is much of the same. Sour Patch Kids fell from the top spot to #2 and was replaced atop the throne by Kit Kat. Snickers jumps onto the scene for the first time at #3. Reese’s Cups is out of the top 3. It’s not always hot in late October in Indiana. Leaves have changed and flannel shirts and basketballs are out in droves. To balance things out, Hot Tamales rain down in Hoosier country. About one hundred thousand pounds of Hot Tamales are consumed around Halloween time. Starburst come in second place, Jolly Ranchers third. There’s a new winner in Iowa this year. Reese’s Cups no longer run the Ozzy Osborne show in Iowa. Candy corn has taken over the top spot, which if you just Google Image “Iowa” shouldn’t be a surprise. There’s a lot of corn there, and there’s a lot of candy corn there too. Over 60k pounds for Halloween season. Iowa may not seem scary or spooky, but consider this. The house from the classic American Gothic painting is in Iowa. Also, remember when Ozzy Osbourne bit the head off a bat on stage? Yup, Iowa. And honestly what’s a more classic scary movie setting than corn fields? For Halloween in Iowa make sure to stock up on candy corn, M&M’s and Reese’s Cups, which dropped back to #3 this year. And stay creepy Iowa. Kansas’s most popular Halloween candy has not changed this year. Reese’s Peanut Butter Cups are still the king of the Sunflower State. M&M’s ruled a couple years ago, but the new champ has retained its crown. You might think with all that corn growing in Kansas, candy corn would be the obvious winner. Nope, it didn’t even crack the top 3. There is a new winner in the Bluegrass State! For 2 years straight, our report had determined the top Halloween candy in Kentucky to be Tootsie Pops. Now, Swedish Fish have come out of nowhere to take the crown with over 73,000 pounds. Still, over 53,000 pounds of those yummy lollipops with the Tootsie Roll center were consumed for the #2 spot. Reese’s Cups were #3. Pucker up trick-or-treaters in Louisiana, your favorite candy for the third year in a row is Lemonheads! Sweet and sour flavors must do well on Bourbon Street. The top candy has not changed with this years data results. What a bunch of Lemonheads they must have down there! Maine is a gorgeous place to visit. Cool summers with dense deciduous topography. Moose tracks outside your cabin on a crystal clear morning near the harbor. Lobster rolls for lunch followed by Sour Patch Kids. Wait a sec. Sour Patch Kids don’t seem completely congruous with the peaceful vibe Maine gives off to outsiders. Is Maine hiding their true identity from the rest of us? If you’re in Maine, let us know what’s going on up there. And also, make sure to stock up on Sour Patch Kids for Halloween. Home to the Naval Academy, Maryland rules the seas and navigates by the stars. They must have developed their love for Milky Ways with all that staring up into the night skies. Maryland consumes over 41,000 pounds of Milky Way bars around Halloween. While Milky Ways are the 3-time reigning champ, there is a new #3 in Maryland. Hershey Kisses have overtaken Blow Pops for the 3-spot of most popular Halloween Candy. So stock up on Milk Ways, Reese’s Cups (#2) and give some love to the kisses too. Massachusetts is actually a pretty scary state. Sure, there are those ghosts of people burnt as witches in Salem floating around all over. And yeah that’s pretty scary. But the most scary thing about the Bay State might be its infrastructure. It’s not uncommon in Massachusetts to see brown or even tar-colored water flowing into your bathtub at night. This is reportedly due to really old underground water pipes and the residue buildup inside them. Gross and freaky, even more-so when you accidentally wash your clothes in the stuff. The gas lines are even worse. The recent residential explosions are case in point. That was truly scary in a way that goes beyond Halloween. Rumors of old gas mains that are still made out of wood (!) suggest MA badly needs to address some of it’s 15th century infrastructure. Scary stuff. Massachusetts’s most popular Halloween candy has not changed this year. Sour Patch is still number one, Butterfinger still #2, and Dubble Bubble replaces Taffy in the #3 spot. So, if you live in Mass. stock up on those guys. Also, get a reverse osmosis filter and flame retardant bed sheets. Ok, this is a other one I get hate email about. Look, candy corn is a divisive candy. It was ranked #2 in our Worst Halloween Candy survey. But people do love it. I am one of those people. We are out there, Agent Scully. Though the trolls don’t believe me, Mighty Michigan still has a love affair with candy corn. This is the third year in a row. The favorite Christmas candy in Michigan is also reindeer corn, which is the same thing in Xmas colors. It’s obviously a thing up there, like sports disappointment and flammable water. Michigan consumes over 150 thousand pounds of candy corn around Halloween. Starburst and Skittles come in a respectable second and third. Minnesota is sneaky. The Land of 10,000 Lakes actually has more like 12,000. Classy underselling, you say? Likely, but if you thought Minnesotans were also painting a picture of being the state with the most lakes, it is not. By a long shot. Alaska has – wait for it – three million lakes of over 5 acres. I’m a little in shock by that. It’s ok though Minnesota, 12,000 is still a whole lot. I don’t think the good ice fishing spots are in danger of overcrowding just yet. Most popular Halloween candy has not changed this year. Tootsie Pops again at over 200k pounds. Skittles were #2, Candy corn #3. Hey, what’s that? A Mississippi Candy bar. For the 3rd year in a row, the 3 Musketeers continue to top the most popular Halloween candies in this state that is home to the largest cactus plantation in the world. Random, but awesome. Stock up on 3 Musketeers and stay away from the cacti at night! Home of the Blues. Gateway to the West. Missouri a no nonsense type of place. A Milky Way bar on Halloween is no joke here. It’s still the most popular Halloween candy in the state so when trick-or-treaters come knocking in MO, make sure you show them the Milky Way. Stretched that one a bit. Still work? Dubble Bubble came in second. Almond Joy jumps into the #3 spot over last year’s Butterfinger. Elk, antelope, deer, eagles, swans, Montana has a rich wildlife population. They also love their bubble gum. Classic Dubble Bubble bubble gum is still the most popular Halloween candy where a River Runs Through It. The #2 and #3 most popular candies swapped places again this year with Twix edging M&M’s in a back and forth battle for runner-up. When you’re setting up for trick-or-treaters in Montana, before you go fly fishing, make sure you have some bubble gum and Twix ready. Hard-nosed college football teams, miles and miles of corn fields and center-pivot irrigation (look it up) are a few of the things Nebraska is known for. They were also getting a reputation for loving Sour Patch Kids, the winner the last 2 years. The naughty sour candies have been usurped this year as the most popular Halloween candy in the state. Salt Water Taffy is the new winner. You do you, Nebraska. Don’t let those little sour whipper snappers box you in. In Vegas they love shiny things. That must be why Hershey’s Kisses do so well in Nevada on Halloween. But they are not the #1 candy in Nevada anymore. After a 2 year reign at the top, they have been brought down by good ol’ candy corn. Candy corn must’ve been tired of being second fiddle and came charging through to number one with nearly 340,000 pounds. Hershey’s Kisses fell back to under 200,000 this year and Skittles’s rainbow no longer shines over the #3 spot. The new third place winner is Tootsie Pops. New Hampshire’s most popular Halloween candy has changed again this year. Starburst has climbed to the top of the ladder again, ousting Snickers, last year’s usurper. And M&M’s jumps Snickers for the #2 spot, leaving Snick at #3. Robert Johnson is one famous hero of New Jersey you may have never heard about. But if you’ve eaten anything with tomatoes in it recently you can salute Mr. Johnson and his famous tomato trial on the steps of the New Jersey courthouse in 1820. After eating tomatoes there and not dying, he debunked a 200-year myth that tomatoes were poisonous. And now we can all enjoy the many good things tomatoes bear! New Jersey’s most popular Halloween candy has not changed this year. Skittles have retained the #1 spot and M&M’s knocked last year’s runner-up, Tootsie Pops, back to #3. We’re still a little sad to see that Salt Water Taffy doesn’t do better in Jersey. It was born in Atlantic City after all. Here’s to hoping for a taffy comeback in NJ! Things keep Breaking Good for candy corn in New Mexico on Halloween. It has remained as the top candy in the state known as the desert-filled setting for Breaking Bad. You won’t need an RV to make yummy candy corns, just buy them from us. 🙂 Less hassle. Oh, Jolly Ranchers are also moving up in NM. They have seized the #2 spot, kicking Milky Way back to #3. New York’s Macy’s Thanksgiving Day Parade featured only one candy float. Guess which candy…. Yup, New Yorkers love Sour Patch Kids so much they build a rolling monument to them. New York is my kinda state! That must be what those Sour Patch Kids say too, because they are getting consumed at a pace over 200k pounds around Halloween time. Candy Corn and Hot Tamales – a new top 3 entry – finish out the top 3. Be careful with trick-or-treaters in NYC, those street wise cats don’t mess around if you don’t have Sour Patch Kids! North Carolina’s most popular Halloween candy is M&M’s. Reese’s Cups used to rule the land where the Wright Brothers first flew, but they were knocked back to second place last year. Now M&M’s have taken over with over 101,000 pounds consumed. Snickers moved into third place, kicking candy corn out of the top 3. Baby Ruth did not make the list, even though Babe Ruth hit his first home run in NC! There’s a lot going on in North Dakota lately. Boomtowns and new industries have changed the landscape in the past decade or so, but it’s still mighty cold up there. That must be why Hot Tamales are so popular. They remain at the top of the most popular Halloween candy list. Followed by Jolly Ranchers and candy corn. Ohio’s most popular Halloween candy has changed again this year. After Blow Pops pushed M&M’s aside last year, M&Ms have seized back the lead, moving Blow Pops back to runner up. Starburst remains in the the number 3 spot. 164,000 pounds of M&M’s is nothing to sneeze at. Good work, Ohio! There’s a new top Halloween candy in Oklahoma. Dubble Bubble has risen from the #2 spot to take the throne away from Snickers, which sits at #2 this year. Skittles bumps Butterfinger out of the top 3. Boise City, Oklahoma was the only US city to be bombed during WWII. They were just practice bombs and they didn’t hit the city directly, they were dropped just south in safety. There were no explosions or surprises on the list of most popular Halloween candy in Oklahoma this year. Snickers tops the list again, with over 20,000 pounds consumed. That’s a lot of chocolate bars. Oregon has more ghost towns than any other state! Wow. Just think of the possibilities on Halloween. If you’re throwing a ghost town takeover Halloween party, better bring your Reese’s Peanut Butter Cups candy. Trick-or-treaters love these more than any other candy in Oregon. M&M’s is in second place, Candy Corn third. Pennsylvania’s most popular Halloween candy has changed this year. Skittles took over the top spot from M&M’s, but not by much. Over 300,000 pounds of Skittles were consumed in PA. Candy corn is #3. And for the first time, Hershey’s products did not crack the top 3 in their home state! Rhode Island likes its independence. They aren’t going to jump off a bridge just because their friends did. They were the last of the original 13 colonies to join statehood and they never even ratified Prohibition. RI isn’t going to be pushed around by anyone. So you better have some candy corn lined up for those trick or treaters or some of their friends on Federal Hill might pay you a visit and make you an offer you can’t refuse! South Carolina has a new top Halloween candy. The 8th State in the union loves Skittles, which takes over from candy corn after a two year reign. Hot Tamales retains the #3 spot. Nearly 119,000 pounds are consumed in South Carolina around Halloween. Official state amphibian, the salamander, agrees: “Skittles are awesome,” says their Chief Salamander. Candy Corn and Hot Tamales round off the top 3. The Crazy Horse mountain carving is most likely going to be pointing to another large mountain carving, of Starbursts. The candy is again atop the list of most popular on Halloween in South Dakota. SD loves carving awesome things into mountains, so don’t be surprised of the #2 and #3 candies, candy corn and Jolly Ranchers, end up in a carving of their own. Tennessee loves the Vols, Music City and Tootsie Pops. Nearly 61,000 pounds of Tootsie Pops are consumed around Halloween time. It retains the #1 spot again this year, followed by Skittles and salt water taffy. Texas’s most popular Halloween candy has changed this year. The Lone Star State ditched it’s Starbursts and returned to it’s previous love, Reese’s Cups. It’s an understandable move, since Reese’s Cups are objectively devine, and they were the top Halloween candy 2 years ago. More than 1,100,000 pounds of Reese’s Cups are consumed in Texas around Halloween. Last year’s winner, Starbursts, retain the #2 spot. Texans can proudly stock up on Reese’s Cups or Starbursts for trick-or-treaters, but might be best to offer them more than a lone starburst! Utah has the distinct honor of having earned the title of Jello capital of the world. Apparently, more Jello is eaten in Utah than anywhere else in the world. Do Utahans give out Jello to trick-or-treaters? We don’t have any data on that. If you do, email me! If we presume that Jello is not commonly doled out to young costume-bearing Mormons, we can confidently state that Jolly Ranchers have a foothold there. Jolly Ranchers again retain the #1 spot in Utah with over 483,000 pounds consumed. Boom! But people from Utah do seem jolly and there are surely many ranches there, so Jolly Ranchers might be more fitting than Jello anyway. Tootsie Pops and Candy corn took second and third place. Vermont has cows and pigs and maple syrup and beautiful mountains and lots of lovely things. They love Milky Way candy bars at Halloween time, and choose local Ben and Jerry’s when they need some ice cream. It might not be cold enough on Halloween to hand out ice cream to trick or treaters. Better stick to Milky Ways. Virginia’s most popular Halloween candy has again changed this year. Hot Tamales have reclaimed the crown! There have been some people who doubt the viability of Hot Tamales as a top contender for favorite Halloween candy. We are here to tell you that spicy candy is for real. Believe it, and Virginia is one place where it is happening. Over 160,000 pounds of Hot Tamales candy is consumed in the birthplace of our nation. But Virginia has not lost sight of its heritage. It was the first place in the US where peanuts were grown, and Snickers came in second place – fallen from the top spot last year. Are you a part of the old guard of Snickers lovers or the new crowd of spicy Hot Tamales lovers? Better play it safe and have both ready for when the doorbell rings on October 31st. Aberdeen was once referred to as the roughest town west of the Mississippi. Violence, gambling, drug usage and prostitution were all popular pastimes in this Washington city. It probably wasn’t a place that was very receptive to trick-or-treaters. But I bet they still loved salt water taffy! Salt water taffy had ruled the state a couple years ago, but in last year’s study Tootsie Pops stole the top spot. Well, taffy is back baby! Over 220,000 pounds of Salt Water Taffy are consumed in Washington around Halloween. Maybe that’s how Aberdeen cleaned up its act. They found a new vice. M&M’s rule The District for the third straight year, melting over 26,000 pounds in their mouths, not in their hands. It isn’t really a state, but since people still trick-or-treat there, we included it in our study. But it is too small to fit on our super slick interactive map, sorry DC. If you’re stocking up in the DC area, make sure to get M&Ms, Tootsie Pops, and Blow Pops. With a median age of 40, West Virginia is the oldest state in America. So what do these old fogies prefer on Halloween? Something classic like a Clark Bar or Necco Wafers. Nope, it’s Blow Pops for the third straight year. Maybe they prefer something that doesn’t require teeth. Ouch, sorry WV. West Virginia is also considered the northern-most southern state and the southern-most northern state. I guess that just means it’s in the middle? Great skiing at Snowshoe and lots of beautiful country in WV. For Halloween, stock up on Blow Pops, Milky Way and Hershey’s Mini Chocolate Bars. They were numbers 1, 2, and 3. Wisconsin’s most popular Halloween candy has changed again this year. Butterfinger reclaims its title as the Top Halloween Candy. The top 2 candies actually switched places again this year, as Starbursts edged out Butterfinger for the top candy in last years study. Also Hot Tamales stole the #3 spot away from Jolly Ranchers. Those badgers had a big change this year with all 3 spots changing hands. Get some Butterfinger if you’re stocking up in the Badger State. Wyoming was the first state to grant voting rights to women, it’s home to the Grand Tetons and Yellowstone and big skies abound. The top Halloween candy is Reese’s Peanut Butter Cups. Homes can be pretty spread out in Wyoming, but if you do plan on getting trick or treaters, make sure to give them – and their horses – some yummy Reese’s Cups. Thank you Candystore.com for doing the research and providing us Americans with great knowledge.